In the beginning, there was no coaming. The spray skirt was built-in to the kayak deck. 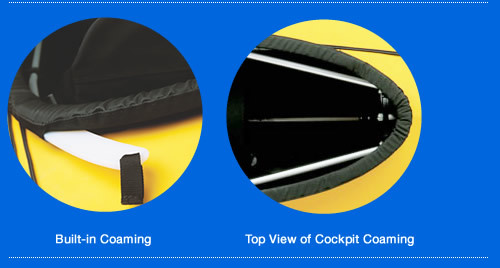 In 1990, we developed a detachable fibreglass coaming rim for the cockpit, and were able to use a traditional style of spray skirt along with our sea sock. The large fibreglass coaming used on the K1 and K2 Expedition kayaks is no longer made. If a coaming has broken, best to do a repair with an epoxy or fibreglass. In 2005, the cockpit coaming design was changed to be a “built-in coaming”. By 2006, all the models were changed to have this style of coaming. Assembly has been simplified and worry of breakage in shipping has been eliminated. The spray skirt and sea sock fit as usual. As part of the design change with the built-in coaming, cockpit bracing bars were added. These bracing bars can also be added to some older kayak models too. How is the coaming made and how does it work? The built in coaming rim is made of fabric sleeves sewn and welded to the cockpit opening. In the sleeves are sewn 1/2″ high density foam inserts. At the bow and stern ends of the coaming 1/4″ plastic (high-density polyethylene) inserts are also inserted permanently into the sleeves. Separate 1/4″ HDPE side inserts slide into pockets along the underside of the built-in rim. These side inserts are removed when rolling up the skin. The sea sock and spray skirt are attached just the same, by tucking under the coaming rim. Thigh brace bars fit on either side of the cockpit. For the best fit of the cockpit, and best bracing, insert the bars; for a roomier cockpit, leave them out. The bars add rigidity to the cockpit and is useful when lifting the kayak at the cockpit. Can the fibreglass coaming be changed to built-in? We are not able to convert fibreglass coaming skins to the built-in coaming.